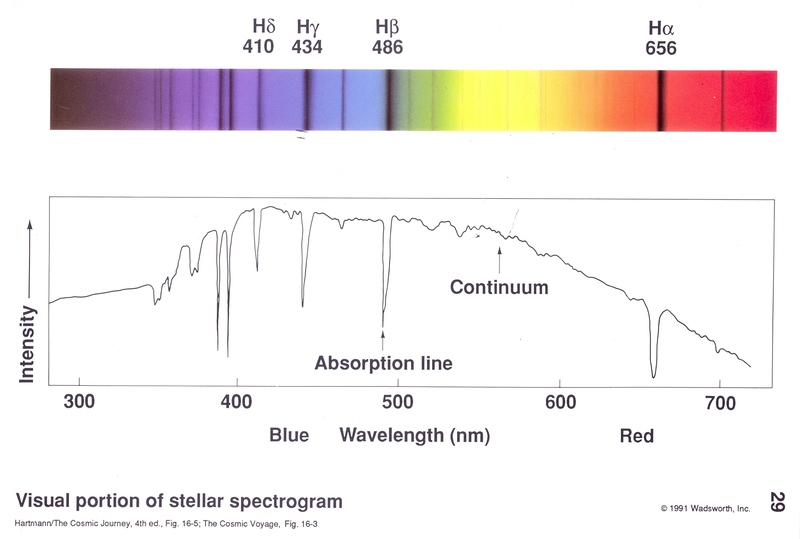 Spectrum of a star For stars, spectra in the visible show absorption lines due to electronic transitions in ions or atoms. The absorption lines are usually quite narrow (width of line as a fraction of central wavelength of 0.001 or less). Analysis of absorption lines can tell us an enormous amount of knowledge about a star- its temperature, chemical composition, rotation, turbulence in atmosphere, electron density, surface gravity. etc etc. 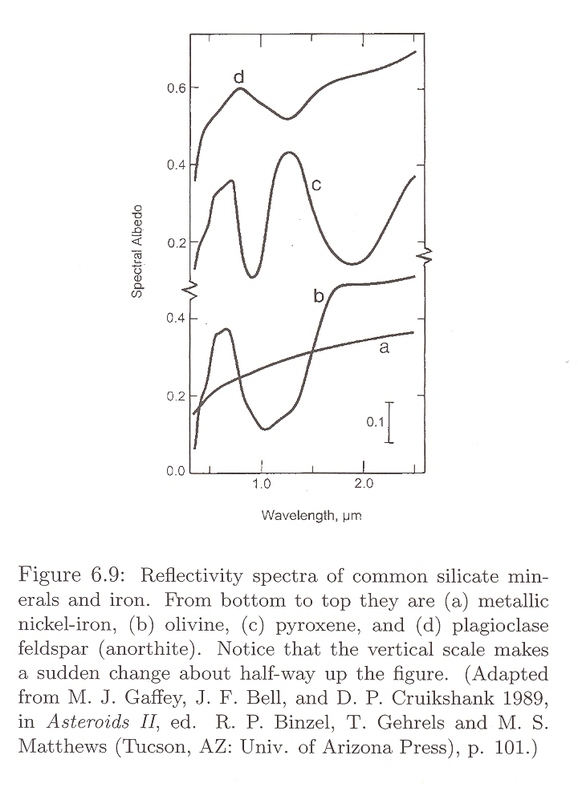 Spectra of silicate minerals The visible/ near IR reflection spectra of a silicate mineral looks quite different from that of a star. 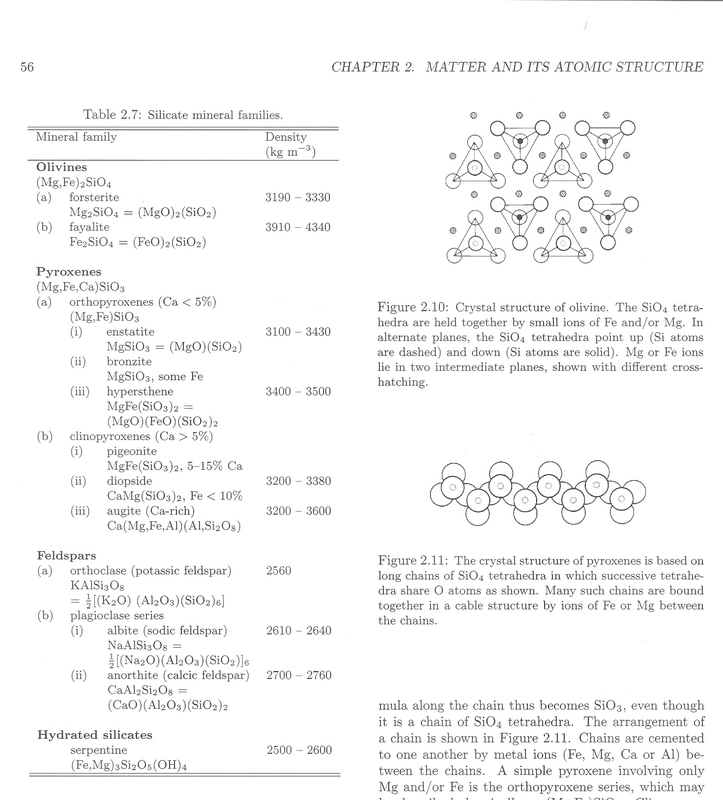 Instead of narrow atomic electronic lines, there are very broad (fractional width of 0.1-0.5!!) features due to solid state physics- things like bending of crystalline bonds. Spectra of asteroids The left shows spectra of a few asteroids. 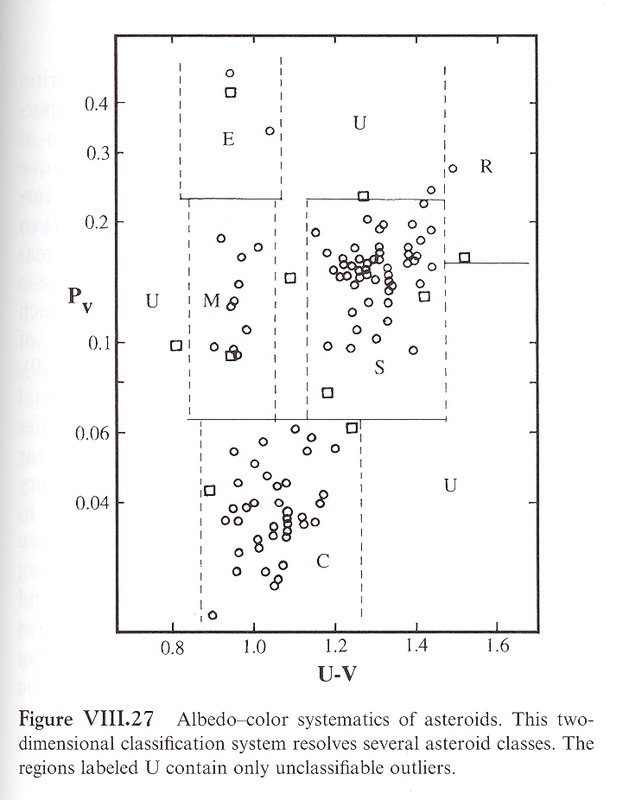 These look like the spectra of silicate minerals, rather than stellar spectra, of course. 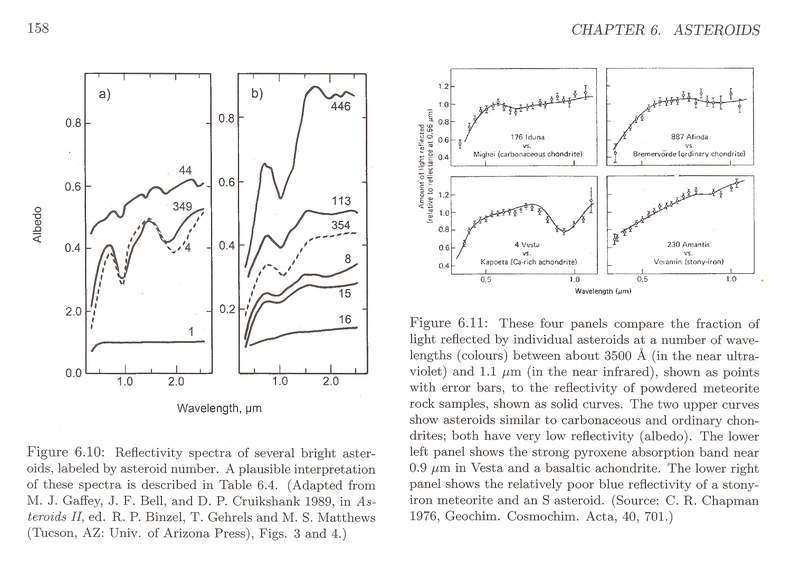 The right hand figure shows some asteroid spectra and lab spectra of meteorite analogs. Spectral types of asteroids Asteroid spectra have been classified into "bins" of similar spectra and given letter designations, much like the spectra of stars. For stars, it was realized that the spectral classes could be arranged in a physically meaningful pattern based on the stars temperature. No such easily recognized pattern is obvious in the spectra of asteroids, but the spectral classes are still useful for classifying asteroids. Silicate mineral families Minerals based on silicon and oxygen are found everywhere on Earth and in stony asteroids. This just gives a little flavor of some of the major silicate minerals. The diagrams show just a hint of the types of crystal structures that are present in different minerals. Asteroid colors and albedos Colors of astronomical objects are easier to obtain than spectra. However, colors convey much less information than spectra, and objects with different spectral types can have the same colors. However, for asteroids, colors can be useful particularly if combined with some other property such as albedo. Here is a plot of U-V color vs. albedo. 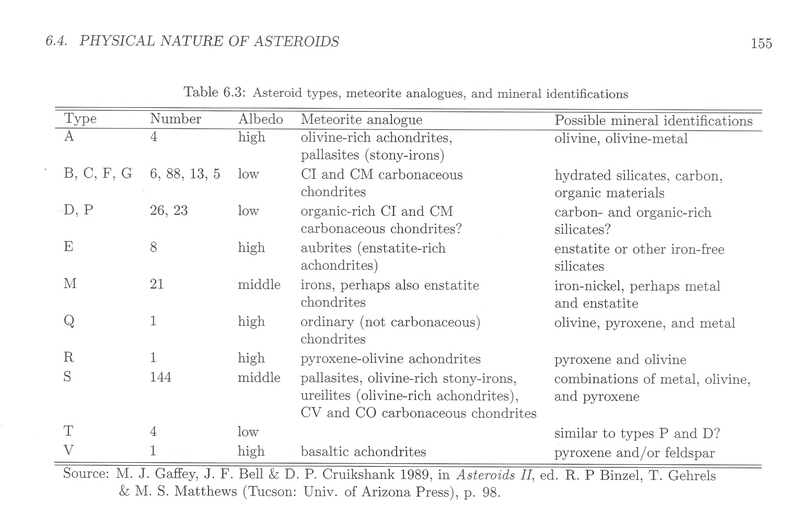 Different classes of asteroids lie in different parts of the graph, as indicated by the labeled squares. Thus, if we get a color and albedo for an asteroid, we can make a rough estimate of its spectral type. Several different color systems have been developed to classify asteroids on the basis of colors. 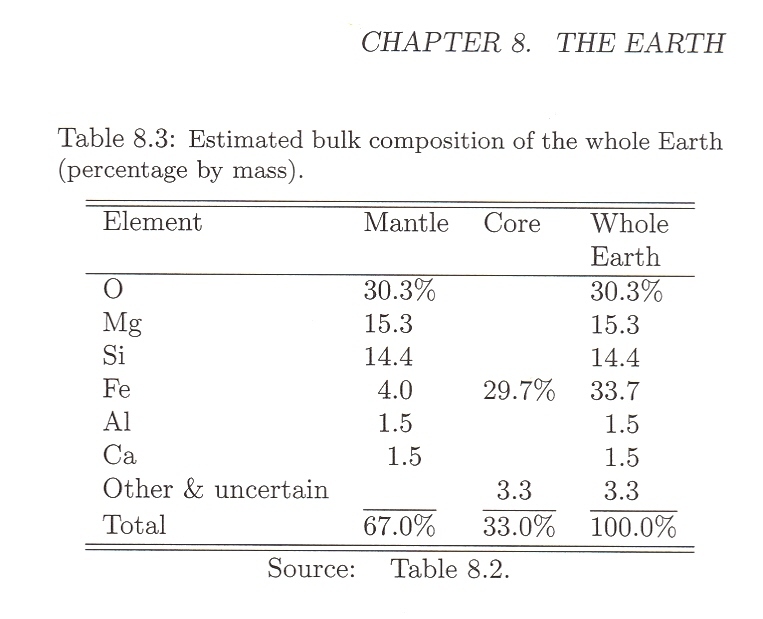 Bulk composition of Earth This table shows the most common elements in the Earths mantle, core, and whole planet. Note that H and He, elements which dominate the composition of the Sun, are not among the most common in the Earth. Bulk composition of Solar Nebula This table shows the most common elements in the Solar Nebula. The composition of the bulk of the Sun is similar (in the core of the Sun some H has been converted into He by fusion). Note that H and He dominate the composition of the Sun. 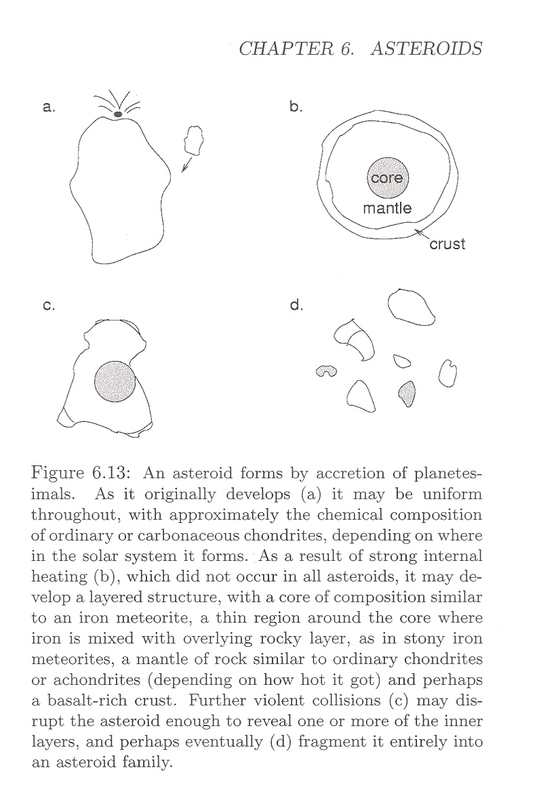 Core/mantle structure This cartoon shows how an originally uniform composition asteroid can develope a core/mantle structure if it undergoes enough internal heating to melt the iron. The source of the heating in asteroids remains an open question. Accretion heating and long-lived radioactive element heating are too slow to heat up asteroidal sized body much (they loss the heat almost as fast as it is produced). Perhaps short-lived radioactive heating, which acts faster, may be responsible for heating some asteroids. 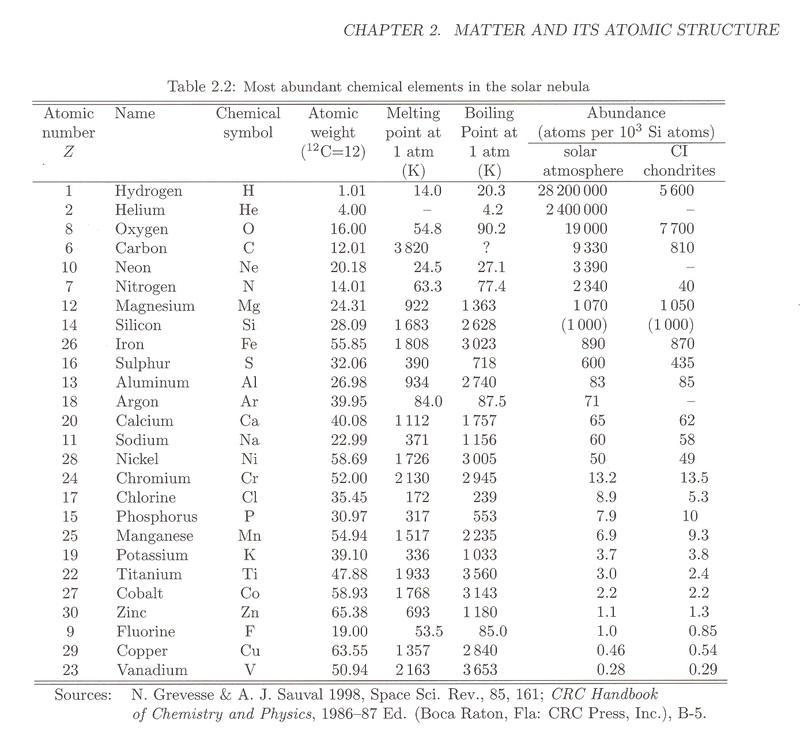 The most important such element may be 26Al (aluminum 26), a radioactive isotope with a 700,000 year half-life (far shorter than the 4.5 billion year half-life of Uranium). If the Solar Nebula formed near a supernova, it may have incorporated short-lived radioactive isotopes from the supernova explosion.